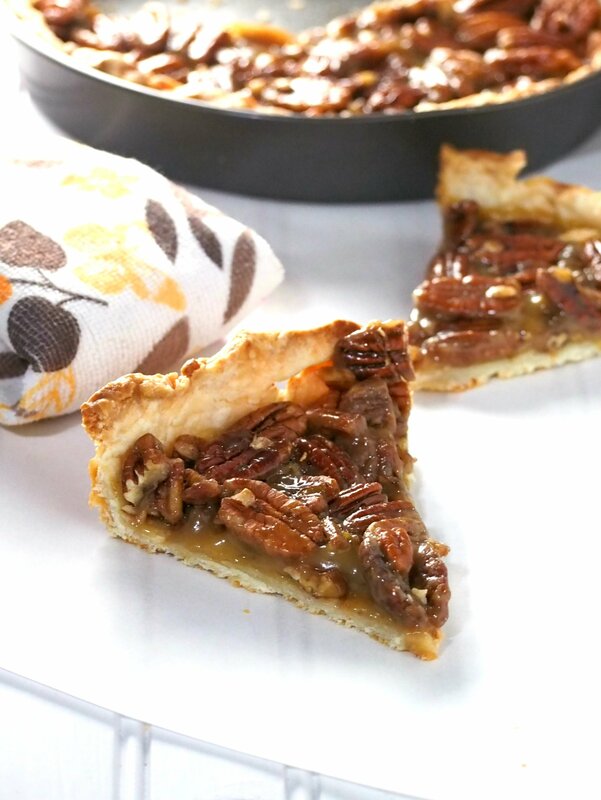 Make this easy Pecan Pie and indulge on these crunchy and sweet pecans nestled in a flaky cream cheese pie crust. This is ultimately a pecan overloaded dessert without being overly sweet and rich. It is the best Pecan Pie ever if you ask me! Ever enjoyed a piece of bread or muffin studded with pecans and then once the whole thing is finished you find yourself wanting more of the pecans? That is me. Sometimes I even pick out all the pecans and eat them first. The thing is, I always find myself wanting more of these nuts. Because when I have them just as toppings or adornments, I just can’t get enough. 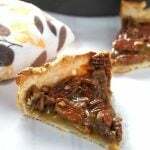 Now, this pecan pie is a delicious answer to that problem of mine. 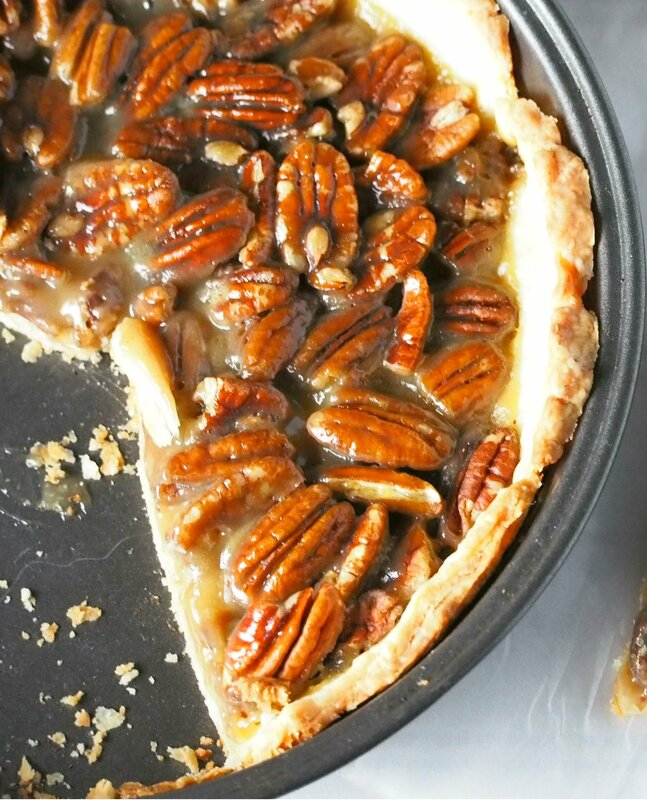 This pie is without a doubt, a pecan overloaded dessert, and if you are like me who always end up wanting more pecans from bread and muffins, this is for you. Crunchy pecans all over, and with the sweet slimy liquid coating them, it is a total deliciousness in every bite. Add to that, the whole thing is on a thin and crisp cream cheese pie crust. 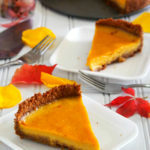 The texture and the buttery sweet flavor is truly satisfying. I don’t think you will ever still feel short of pecans once you have this. But actually, I think you will. Every time I see this pecan pie on the table, I can’t resist the urge to have a slice. 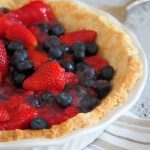 One important element, the cream cheese pie crust elevates this pie because it is crisp, thin and so buttery. Being a pastry lover, I am just so delighted with this pie crust. 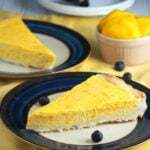 I have used it in my ube custard pie and lots of other baked pastries. The results are always nothing less than amazing. In a large bowl, add the flour, baking powder, and salt. Whisk together to combine. Add the cream cheese and using a pastry cutter, cut it into the dry ingredients until the mixture looks like a coarse meal. 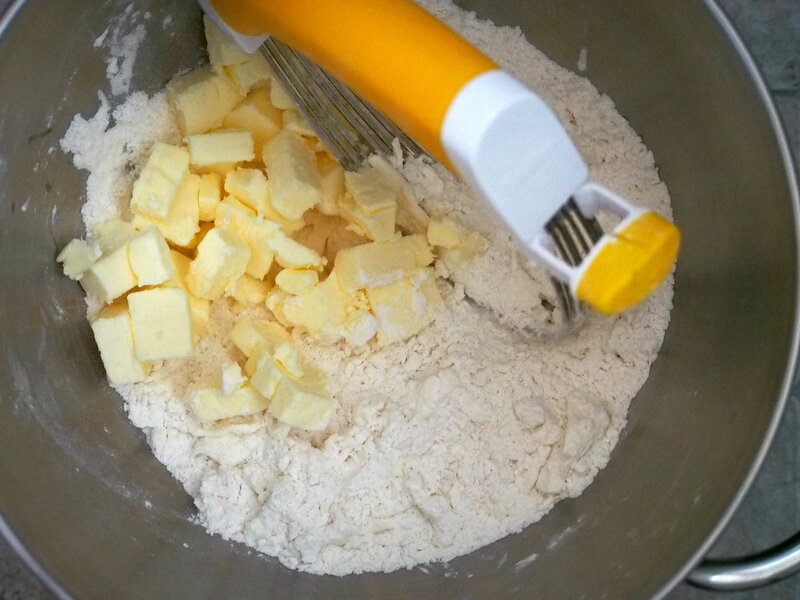 Add the cubed butter and cut into the mixture until it looks like crumbs with some bigger pieces mixed in. Add the cream and the cider vinegar and mix everything until the dough is coming together when pressed. Gather dough into a disc, wrap in plastic and refrigerate for 4 hours to overnight. You are going to blind bake this crust, that is to bake it without the filling. So after chilling, roll it into 1/8 to 1/4 inch thickness and mold it in a 9-inch pie pan. Note: If dough tears as you mold it into the pan, just pat it with excess dough and fix. Playdough style, baby. Nothing complicated. Line the crust with parchment paper and fill the hollow with uncooked rice. Bake this at 425 F for 20-35 minutes. The edges should be lightly golden. Blind baking is important so that the crust does not puff up when baked with the filling. It keeps it thin and crisp as well. An extra step, yes. But it is really worth it. One more thing, when baking the pie with the filling, use a foil ring. Now, this is not as fancy as it sounds-just a piece of foil slightly bigger than your crust. It does not need to be round, even. A big piece of the foil straight from the roll will do. Cut a big hole in the center so that the filling is exposed but the edges of the crusts are covered. You see, because the edges of the crust have browned slightly from blind baking, the foil ring helps to protect those edges from getting burnt when baking the pie with the filling. This Pecan Pie will satisfy your cravings for crunch and sweetness. I am actually wanting a slice right now. Trust me, once you have a slice, it is going to be natural to want more and more. I am thinking that is not always a good thing. 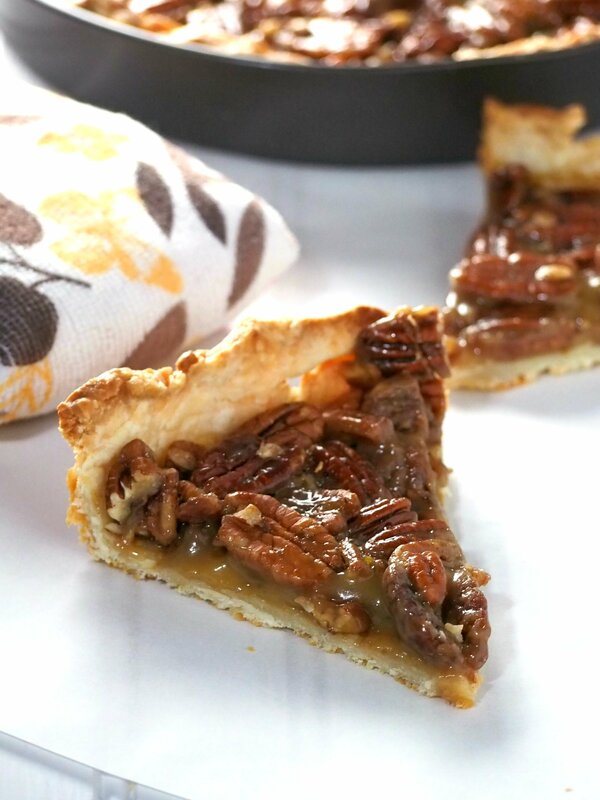 A simple and delicious pecan pie nestled in a flaky cream cheese pie crust. In a large bowl, combine flour, salt, and baking powder. Add the cream cheese and incorporate it into the flour mixture by pressing it with your fingers and smashing with your palms. Work quickly until the mixture resembles coarse meal. 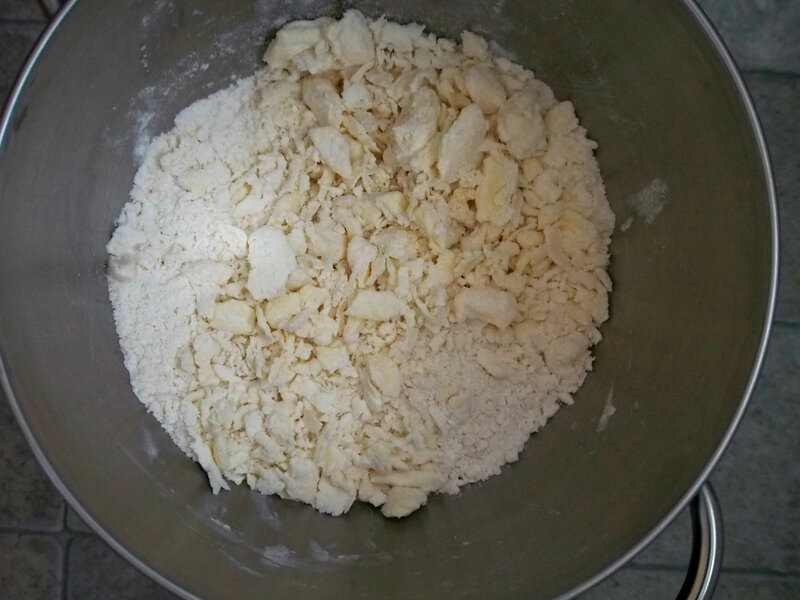 Add the cubed cold butter and incorporate it into the flour by pressing with your fingers but leaving the butter pieces just flattened and still visible. The mixture should look crumbly with big pieces of crumbs from the addition of butter. Add the cream and apple cider vinegar and combine until dough is almost coming together. Gather it into a ball, flatten into a disc and wrap with plastic. Refrigerate dough for about 6 hours or overnight. On a floured surface, roll the dough to about 1/4 to 1/8 inch thick and gently wrap it around the rolling pin. Lift it gently over the pie pan, lower and center it down and tuck the dough into the sides of the pan. Cut excess dough on the edge of the pie pan and use your fingers or a fork to create decorative borders. Refrigerate dough for at least two hours. Preheat oven to 425F. Line the pie crust with parchment paper that extends up the sides. Fill the hollow with uncooked rice or beans and blind bake the crust for 20-25 minutes, until the edges are lightly golden. Remove the pie weights and set aside. Arrange the pecan halves on the surface of the baked pie crust. 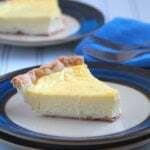 Preheat oven to 350 F. In a medium saucepan over low heat, add the butter, sugar, cream, honey, salt and egg yolks. Cook while stirring often and without letting it boil. When it has thickened slightly and is uniform in color, turn off heat. This should take about 7 minutes or so. Strain mixture in a bowl and stir the vanilla. Pour the mixture slowly over the pecans in the crust, covering them with the liquid. make a foil ring by cutting out a piece of foil that is slightly bigger than your crust, cut a big hole in the center so that the edges of the pie crust is covered while the filling is exposed. Place this on top of the pie and bake for 20 minutes. The filling should be slightly bubbling and slimy. Let pie cool for 45-50 minutes before unmoulding. Preparation times does not include chilling of pastry dough which is 6 hours. Recipe adapted from The Pie and Pastry Bible by Rose Levy Berenbaum.